Around the world, JMeter and LoadRunner remain some of the most popular tools for load testing. These are truly excellent tools and most performance engineers use them. When choosing load testing tools the main question is whether the tool supports all the required protocols? When it comes to HTTP, the selection of tools is enormous, including excellent cloud solutions that make it possible to create a load simultaneously from different points on the planet. For less common protocols the number of suitable tools shrinks considerably. In these cases, the indisputable leader is LoadRunner, an HP product and the de facto standard in the enterprise segment. However, there are protocols that even LoadRunner does not support. For example, voice traffic must be emulated to load testing call centers’ IVR and IT systems. Neither LoadRunner nor JMeter has standard support for the appropriate protocols (SIP, etc.). 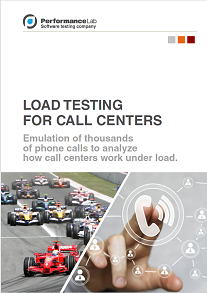 Accordingly, when it comes to load testing IVR systems performance engineers have to search for other solutions that are generally outside of their areas of expertise. An elegant solutions to this problem has been created by Data Synergy, our Australian partner. Data Synergy VOICE is a solution that can use the familiar tools LoadRunner and JMeter to create scripts to emulate the behavior of voice communications customers. Data Synergy VOICE works as a plug-in for LoadRunner and a connectable class for JMeter. The picture below shows the interface for Data Synergy VOICE in the LoadRunner VUGen environment. General inbound and outbound voice traffic over SIP channels. Emulate the complex algorithms of voice services. Emulate audio and video streams. Measure the quality of the voice connection (delay, distortion, packet loss, PESQ).